One hopes that when a house is constructed on a property that those responsible for the landscaping have considered how the property will drain. However, in many instances this is not the case. As well, as time goes by, homeowners change, modify and add to landscaping and to the footprint of the house by adding walkways, driveways, patios, trees, flowerbeds and other water run-off diversions. It then becomes the property owners challenge to correct the drainage defects. One excellent alternative is the use of French drains. 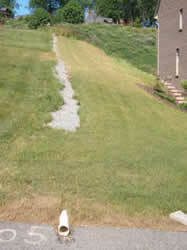 Figure 1 - French drain used to control the direction of water run-off from on a hill. Improper drainage of a property can be the cause of excessive water in certain areas of the home's landscape, wet basement walls which can result in mold and mildew and in the extreme can be the cause of flooded basements. While in some cases excavating around the perimeter of the house in order to add drainage tiles or weeping tile is the only solution to wet basement walls, in many other cases it is only a matter of providing a method for the water to conveniently drain away from the home. This type of drainage is called a French Drain . French drains can also be used to provide drainage to garden areas, and to control the direction that water run-off will take, as shown in Figure 1. 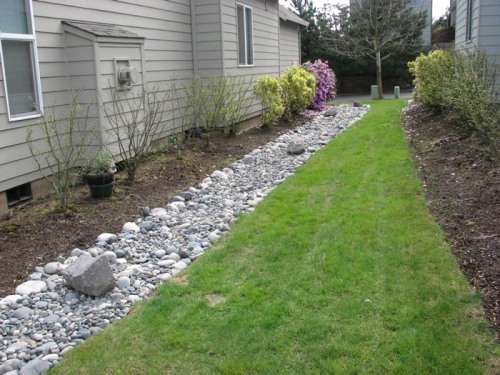 The simplest French drain is a channel, lined with an aggregate (gravel) that is sloped away from the house. The water flowing in this style of French drain is visible and in will not contain water until it rains, as shown in Figure 2. As alternatives, French drains can be created by using rocks and stones to create a path for water flow as shown in Figure 3.
or they can be constructed, by pouring a concrete bed in the shape of a V , as shown in Figure 4. By digging the channel deeper and then adding a drainage pipe or weeping tile (a pipe that has been perforated around its circumference to allow water to enter it) above the aggregate and then covering it with more aggregate, earth, soil and grass or mulch, you create an underground channel that will direct the unwanted pooled water away from the home. Note: It is possible to make a French drain using aggregate only and not incorporating the drainage pipe, and this was common years ago when the piping had do be accomplished with expensive clay tile. However with the advent of PVC pipe, the cost of using pipe in the channel is quite economical and enhances the water flow as well as extending the life of the French drain. 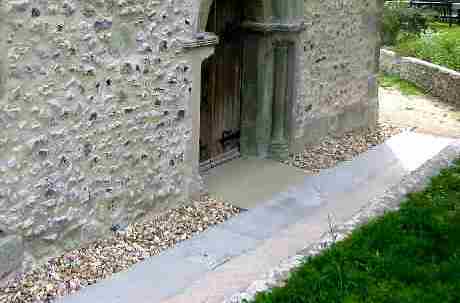 The aggregate that surrounds the weeping tile is necessary to prevent earth and/or soil from entering clogging the holes of the weeping tile as water enters. Most of the drainage pipe , as shown in Figure 5, used today is flexible and for residential applications a 3 or 4 inch pipe is more than adequate.